The number of women serving in the House and Senate began to grow in the 1970s, but by the mid 1990s, Washington had the highest percentage of women in its Legislature of any state in the nation. The 1990s was often called the "Decade of the Women" because of these political achievements, but the gains continue to the present day. In addition to mere numbers, women had also assumed important leadership positions and had been accepted for their individual skills and accomplishments. 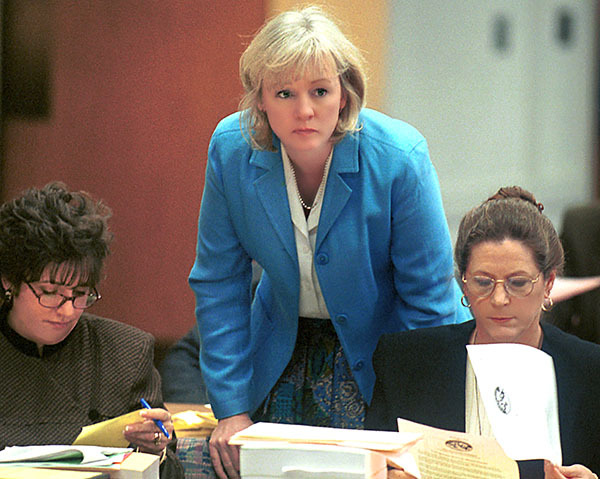 Six House committees in the 1990's were chaired by women, who earned the moniker "Steel Magnolias" from then Speaker Joe King for their work in hammering out the important growth management bill. Following the 2001 Nisqually Earthquake, Legislators met in temporary quarters. Left to right: Senators Tracey Eide, Julia Patterson, and Georgia Gardner consider legislation in the Pritchard Building.